The Salute to Faculty Excellence Dinner and Awards Ceremony was held on October 2, 2015 at Apogee Stadium. Honored at the event were faculty members receiving tenure and promotion, emeritus faculty status and top awards including three cash awards funded by the UNT Foundation, a co-sponsor of the event. Dr. Angela K. Wilson, Regents Professor of Chemistry and the Director of the Center for Advanced Scientific Computing and Modeling (CASCaM), received the UNT Foundation Eminent Faculty Award for her international contributions to computational chemistry. 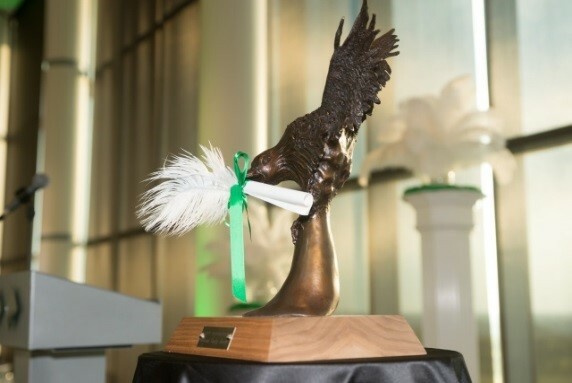 In addition to the $15,000 cash award supported by the UNT Foundation, Wilson was presented with a commemorative medallion and a bronze eagle sculpture. By tradition, throughout the year the bronze eagle is displayed in the honoree’s department to publicly recognize his or her accomplishments and to acknowledge the support of fellow colleagues, administrators, students, and staff. The eagle is now on display in the Chemistry Department. Congrats to Dr. Wilson, the Department of Chemistry, and to all faculty members recognized at the 2015 'Green Tie Affair'. Sean Powell, Assistant Professor of Music Education, is in his second year at UNT, but is already having a big impact. Professor Powell has started what will be a student-led podcast for Music Education, set for launch this month. He also serves as coordinator of Music Education’s Master’s program, and in this role he has taken the lead in establishing an innovative summer Master’s degree program set to debut in the summer of 2016. This program will be especially tailored for elementary, secondary, and high school educators and will allow individuals to complete a Master’s in Music Education after three summers of study. Professor Powell has managed these accomplishments while maintaining a high level of scholarship, with several recent publications in the top journals in his field. 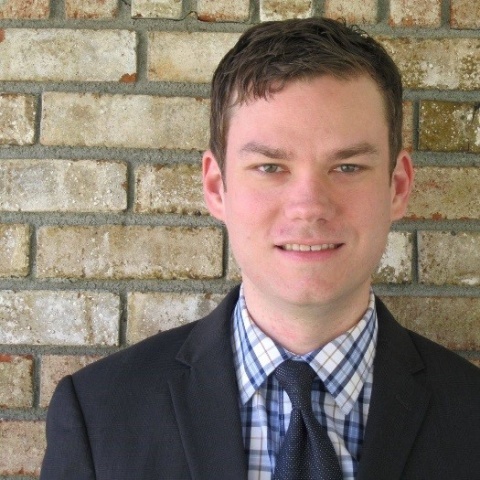 His exceptional work has led to national recognition: he is the Southwest Division Chair of the Society for Music Teacher Education, a national organization. Using a grant from the Dollar General Foundation, Ricardo González-Carriedo, Assistant Professor in Teacher Education and Administration, has implemented a reading program targeting adult English as a Second Language learners. Collaborating with Denton Independent School District, he has distributed over five hundred leveled readers to adult learners. Professor González-Carriedo is collaborating with two graduate students and faculty member Leticia Anaya of UNT’s Department of Engineering Technology on a research project to study the effectiveness of the reading program. Initial results show that the program has had a very positive impact on the participants’ English literacy skills. Professor González-Carriedo believes this research will be instrumental in securing additional external funding to expand this program. The books distributed to date have remained with Denton ISD and are now being used by hundreds of adult English learners in the Denton community. 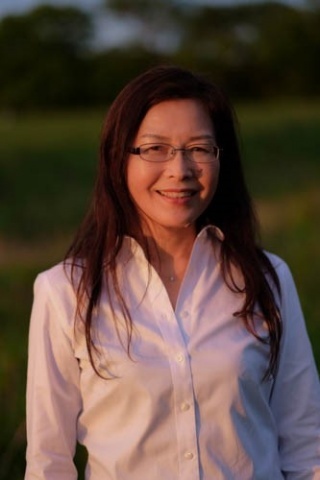 Senior Lecturer Yayoi Takeuchi of UNT’s Department of World Languages, Literatures, and Cultures has been an innovative educator on our campus since she arrived in 2006. She was recently named the Japanese Teacher of the Year by the Texas Foreign Language Association. In addition to working with her colleagues to move UNT closer to being able to offer a major in Japanese, Professor Takeuchi leads study abroad trips to Japan. Among many other stops, her groups experience the vibrancy of Tokyo, visit the Peace Memorial Museum in Hiroshima, and travel to the coastal city of Rikuzentakata. The city was largely destroyed by the earthquake and tsunami of 2011. Seeing the scope of the devastation and the remarkable ongoing recovery and rebuilding efforts are key pieces of the student experience. Professor Takeuchi has training in the fine arts, with an undergraduate degree in studio art. She believes this background makes her a more effective educator, allowing her to incorporate broader themes into the classroom. Among her many accomplishments, Professor Takeuchi served as the interpreter for gymnast Nadia Comaneci during the 1999 International Gymnastics Competition in Nagoya, Japan. Next on her list: she hopes to work with municipal officials to establish a sister city relationship between Denton and a city in Japan. For more information please visit the SPOT website. 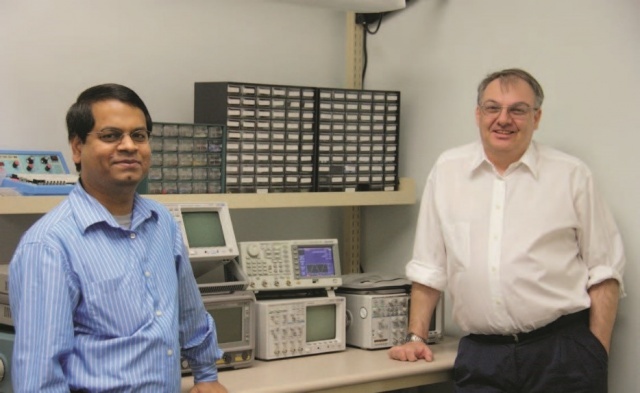 Computer Science and Engineering (CSE) Professor Dr. Saraju Mohanty and Engineering Technology (ETEC) Associate Professor Dr. Elias Kougianos have been awarded two U.S. patents for their work in advancing the design and simulation of integrated circuits, which are used in portable technologies such as smart mobile phones and tablets. The patent titled Methodology for Nanoscale Technology based Mixed-Signal System Design presents several new design optimization methods that can dramatically speed up the design exploration process of circuit and systems, thus reducing non-recurrent design cost of the chip and making electronics affordable for larger segments of society. The second patent, titled Intelligent Metamodel Integrated Verilog-AMS for Fast and Accurate Analog Block Design Exploration, presents an idea called iVAMS, a paradigm shift in electronic design automation that can allow full-chip simulation of the circuits which is not easily possible in traditional simulators. 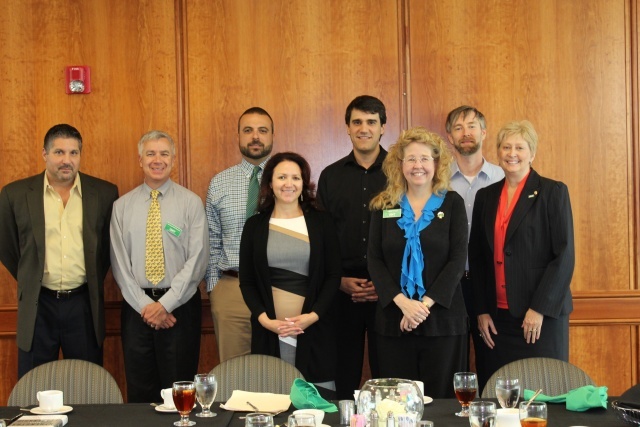 On October 13 Provost Graves hosted an informal Q & A session to learn more about tenure and promotion at UNT for all probationary, tenure-track faculty and associate professors seeking tenure and promotion as well as support staff who assist in the process. The next session will be held on February 5, 2016. A new mentoring group for LGBT faculty has formed, and would like to invite you to their first mentoring and networking event on Thursday November 12 at 5:30; light hors d'oeuvres, wine, and beer will be served. For more information and to RSVP, please contact Mark Vosvick. This group is supported with a faculty mentoring grant from the Provost's office. The Office of Research and Economic Development cordially invites you to a seminar entitled “Getting Started on Research Grants and Support at UNT.” This event will be held on Monday October 19 from 3:00-5:00 p.m. in Gateway 42. In support of the University’s vision of cultivating excellence in the next generation of scholars and leaders for the global community, the Global Affairs Committee (GAC), a Provost-appointed, university-wide advisory committee with membership including faculty, administrators, staff, and Student Government Association, seeks nominations for the Citation for Distinguished International Service award. The deadline for nominations is Friday,October 23. Nomination packets can be delivered to UNT-International, 102A Marquis Hall, attention: Mary Beth Butler. See the call and nomination form here. Have you ever left a meeting wondering, “How could I have done that better?” During a luncheon on Friday, October 9, 2015, Drs. Christy Crutsinger and Angela Wilson discussed talents and strengths and how these can help one develop personally and professionally. A special salute goes out to Professor Joe O'Donnell and his students in HGMT 3250 (Restaurant Operations I) and HGMT 4250 (Restaurant Operations II) for preparing and serving a delicious luncheon! Look for information about future WFN events on our website and in future newsletters. Interested in Teaching in UNT's Core Curriculum? Each year UNT’s University Core Curriculum includes nearly 6,000 sections of courses covering more than 50 disciplines. Approximately 2,400 faculty teach more than a quarter of a million students. UNT’s core serves to develop students’ critical thinking, communication, personal responsibility, quantitative reasoning, social responsibility, and teamwork skills. Coordinating this effort is Dr. Jeanne Tunks, Director of the Core Curriculum. She believes that the Core is instrumental in UNT’s ability to produce graduates who can solve problems, represent themselves well when applying for a job or working as a volunteer in the community, and apply these skills in their future beyond UNT. 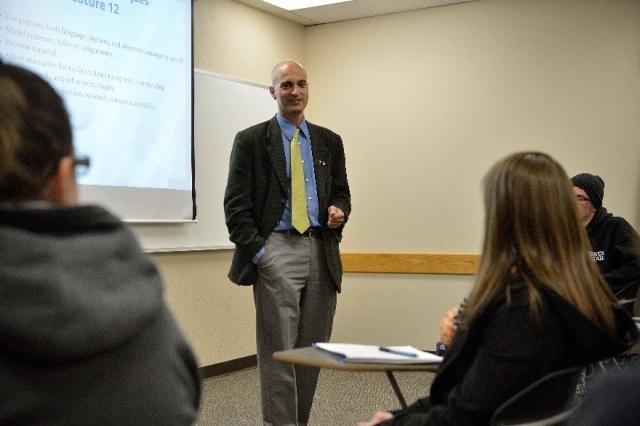 Dr. Tunks provides guidance and assistance for new core course development, revisions to current core courses, the processing of core course requests, the assessment of core courses, and the reporting of assessments within the Core. She is glad to meet with anyone interested on Core development, assessment, and improvement. If you want to drop by for a visit sometime to discuss Core, she can be found in Hurley 135C, by phone at 940-369-5151, or email: Jeanne.tunks@unt.edu. How do you connect with students? How do you find the right work-life balance? Jeff Allen, Regents Professor of Learning Technology found the answers to these and other questions in unconventional ways, including learning to box. Allen recently joined other award winning faculty in a series of Pecha Kucha presentations at an event sponsored by CLEAR. Take six minutes and 40 seconds to enjoy at least one of these inspiring videos, presented by UNT’s very own faculty. We are certain you will want to watch them all. UNT Libraries is sponsoring a variety of events recognizing the Open Access movement, a global initiative to make scholarly research available online, fee-free and without most copyright limitations. Each year for one week in October, university communities worldwide promote Open Access efforts. This year's International Open Access Week theme is "Open for Collaboration." Accordingly, UNT will host various programs to explore the complex issues around scholarly communication and highlight how Open Access facilitates the dissemination of research and fosters collaboration among researchers. UNT is committed to developing leaders capable of catalyzing and sustaining change. The UNT Leadership Fellows program, founded in 2008, supports individual and organizational skill building. Competencies such as increased self-awareness, confidence, broader thinking, relationship-building, and interdisciplinary collaborations are a few of the key outcomes of the year-long program. From left: Leadership Fellow Michael Leggiere, Professor, History; co-leader Michael McPherson, Office for Faculty Success; Leadership Fellow Gabe Ignatow, Associate Professor, Sociology; Leadership Fellow Pamela Padilla, Associate Professor, Biological Sciences; Leadership Fellow Felix Olschofka, Associate Professor, Music Performance; co-leader Angela Wilson, Associate Vice Provost for Faculty; Leadership Fellow Matthew Eshbaugh-Soha, Professor and Chair, Political Sciences; Leadership Fellow Lisa Dicke, Professor, Public Administration.